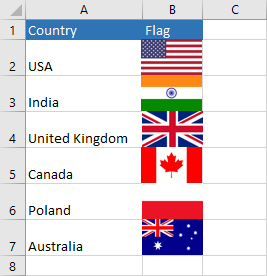 Let’s say that you want to create a table in order to add new images. The problem is that the images won’t behave in the way you imagined. If you hide or filter a cell, the pictures won’t hide as well. They will overlap. I’ll show you how you can insert a picture properly so they will hide together with a cell. In order to insert a picture into Excel cell do the following. Go to Insert >> Illustration >> Pictures. When you have all your images selected, right-click them and choose Format Object…. The Format Picture field will appear to the right. 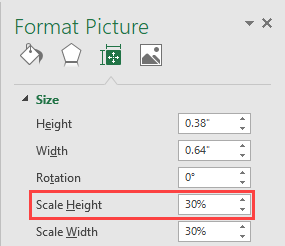 Choose Size & Properties >> Size and change Scale Height to make images smaller. Insert images into a table. Just make cells big enough to fit the images. While you drag the images, hold down the Alt They will snap to the edge of a cell. Click on each image (while holding the Shift key), then right-click and click Format Object… one more time. Go to Size & Properties and choose Properties. 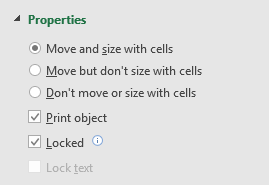 Now, click Move and size with cells. 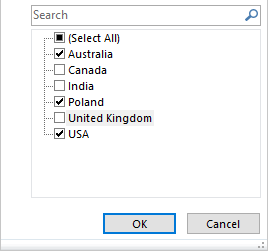 Select all cell in our table (A1:B7) and use the Ctrl + L keyboard Check My table has headers and click OK.
Click the triangle icon next to Country and filter out some of them. Now, when you look at the table, the images show properly. And if you drag them, you can see that there is nothing under them.